At first I was going to leave the fuel line alone. It seemed intact and when I flushed it out I did not get much debris out of it. 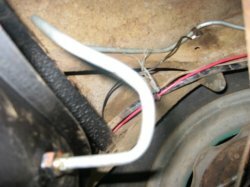 Then I took a closer look and realized the section of fuel line across the front and over the front axle was made of soft copper line. Copper is a bad choice for auto fuel lines because it tends to bend easily and crack if bent more than a couple of times. 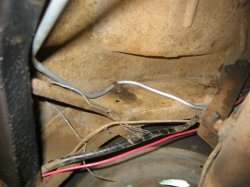 More than one old car has burned up due to a cracked copper fuel line. So out came the old line (I did not take pictures of that). The line is attached to the body with clips screwed to or though the frame rails. All the clips came out intact but there were two that bolted right through the frame rail and were holding brake lines running inside the frame rail. 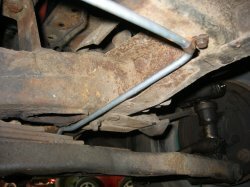 The fuel line had been replaced some time in the distant past and the numb-nuts who did it used slotted screws with the sloted ends INSIDE the frame rail. I could not get a screwdriver on the head of the screws inside the rail so I ended up grinding the nuts off and replacing the screws with hex-heads. Time for a new line. I measured the old line and found that it was 169.5 inches long. That is interesting because it is also the exact displacement of the engine. Weird. Anyway I purchased four shorter sections and used unions to join them. I figured that would be easier to run and if I made a mistake it would be cheaper to fix. That ended up being a wise decision.I had to start at one end or the other so I started at the engine end. Here is the end of the fuel line under the fuel pump at the front of the engine on the passenger side. 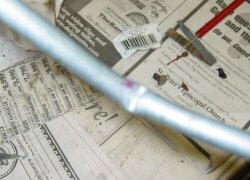 The frame rail is the front frame cross-member. Dimly in the background you can see the cross-member under the engine and the front of the oil pan. The fuel line used to run up over the frame though a little gap in the wheel well. It then ran behind the shock absorber mounts and down the back side of the frame. There was NO WAY to bend a tube such that it could fit in there. 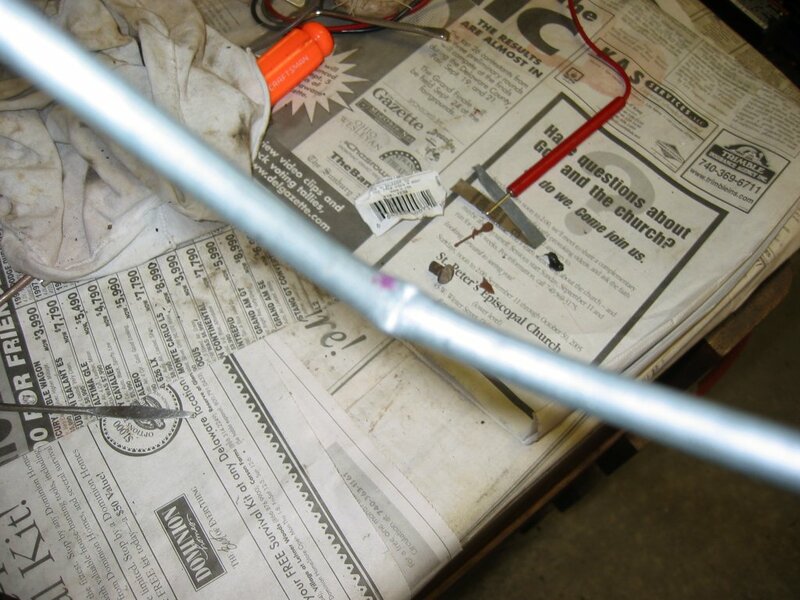 This is probably why that copper fuel line was used last time this was done. The copper could be bent as it was being installed. After using the old copper line to try and find a shape that would work I gave up and decided to run the line along the bottom of the frame rail. I ran it right next to the bolt that holds the front suspension bump stop. 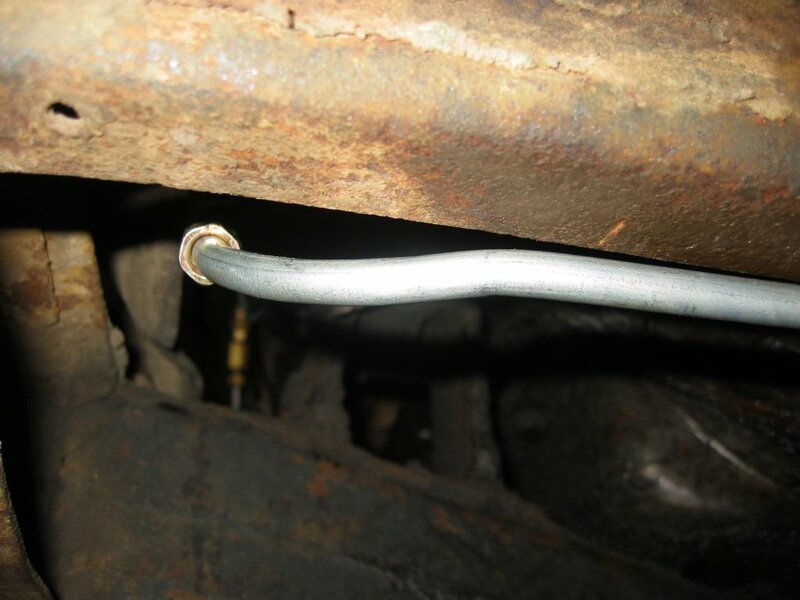 I figure if I bottom the car hard enough to crush that bolt then I deserve to have my fuel line crushed as well. In the picture you can see the line running along the front cross-member then though a clip and down the frame rail. The pyramid-shaped rubber block is the bump-stop and you can see the end of the bolt next to the fuel line. This shot sort shows the fuel line running down the car. The first segment ends at the union you can see towards the front. Just under the front door the line ducks over a body support for the pseudo-running boards then runs back to the rear axle. The line does fit well to the frame rail. The clips holding the line in place were not installed here so it is hanging down a little. And I kinked it. I have a nice tubing bender but it uses replaceable dies to handle different tubing sizes. The screw holding my 5/16″ die on came loose and the die rotated a little bit. This put the tubing across a corner of the die and it kinked in a heartbeat. Rats. I re-bend the part with a new section of tubing and was more careful this time. After the tank was bolted in I added the final bend. I disconnected the line from the tank and pressure-tested it. Once I was sure there where no leaks I flushed the new line out with clean gasoline. Then using my hand vacuum pump I primed the fuel line and carb. 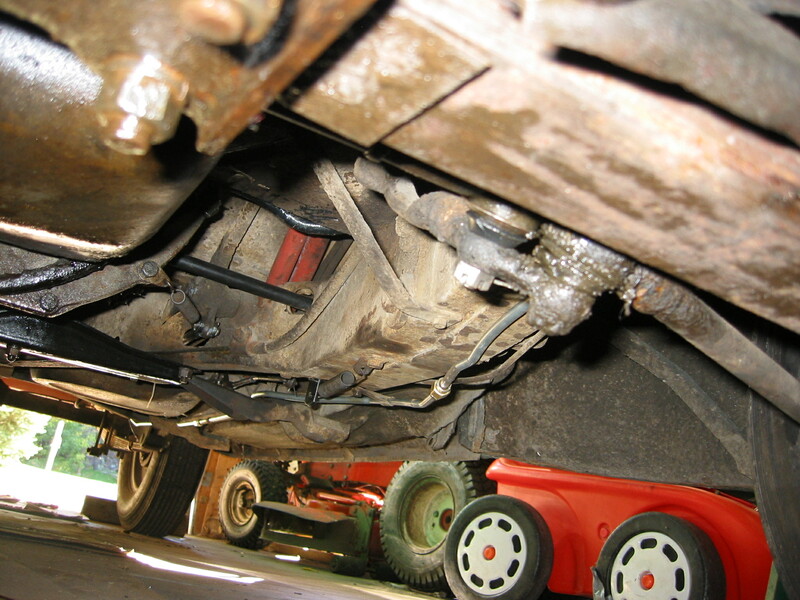 I removed the fuel filter I added because I was not happy with having a fuel filter before the fuel pump. Now that I know the tank is clean I am not so worried about it. Sometime soon I will put a metal filter between the fuel pump and carb. After checking for leaks I started the car. Everything seems fine and there are no leaks.